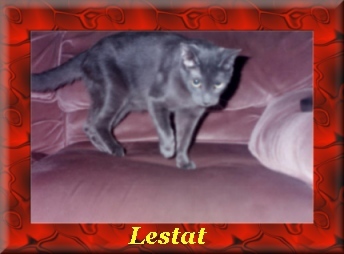 My mommy got Lestat as a kitten when he was 4 weeks old from a lady that had 27 cats. He is five years old now. He is Madelynne’s best friend. When He was 5 months old my other sister Cleo was playing with Madelynne and hurt her by accident. He jumped up, jumped on Cleo’s back and dug his claws in until she let go of Madelynne. He has also done alot of other neat stuff. He knows how to jump up and hang on a doorknob until it opens. He knows how to use the people toilet. Once my mommy was crying and she needed a tissue. he jumped up on the table, pushed a roll of toilet paper off and rolled it over to her. Alot of people don’t believe my mommy when she tells them about him.... until they see him. Last summer a tree frog got in the house. 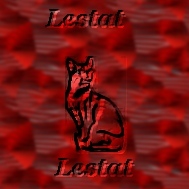 mommy was scared Lestat would hurt it. He didn’t. Instead he picked it up and carried it around in his mouth. He wouldn’t let me or anyone but mommy near it. Everytime I tried to get near it he picked it up and carried it somewhere else until mommy could get it and take it back outside. Baths, anyone hurting me or Madelynne, dogs that can’t behave themselves, taking medicine.